For February’s mini-challenge for Hello Japan! hosted by the lovely In Spring it is the Dawn we were asked to watch a Japanese film, and so I picked Goemon starring Eguchi Yosuke, Ōsawa Takao, Hirosue Ryoko and Okuda Eiji and directed by the talented Kiriya Kazuaki. 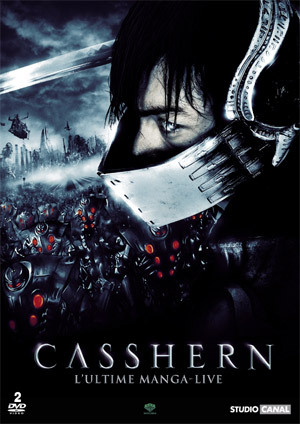 Kiriya is also famous for being the ex-husband of Japanese pop sensation Utada Hikaru and has also directed Casshern starring Iseya Yusuke, a breathtakingly beautiful SF fantasy set in a dystopian future. I wrote a little about the legend of Ishikawa Goemon here and was eagerly looking forward to this film which came out last year. We’ve come to expect slick and futuristic films from Kiriya and Goemon doesn’t disappoint. Although I was expecting a more historically accurate film, Kiriya’s steampunk/renaissance version of Japan’s warring state period (sengoku jidai) depicting the power struggle between the three great generals of feudal Japan, Oda Nobunaga, Toyotomi Hideyoshi and Tokugawa Ieyasu worked in a strange way. It was as though he had let loose the different story-telling potentials and created an amalgamation of different fables to tell this one tale (reminding me a little of Alan Moore’s The League of Extraordinary Gentlemen). Purists may wince, but I really enjoyed this retelling where we get to meet the legendary thief, see some ninja action with Hattori Hanzo, catch a tea lesson with the legendary tea master Sen no Rikyū and watch the political intrigues snaking through feudal Japan culminating in an epic battle which will establish 300 years of the Tokugawa Shogunate. In this retelling, Goemon has severed his past as Oda Nobunaga’s shinobi (ninja) and is enjoying life as a thief who redistributes wealth to the poor together with his henchman Sarutobi Sasuke. However, he unwittingly steals a small wooden box which contains the secret to the assassination of the strong and wise Nobunaga by the renegade general Akechi Mitsuhide. Like Pandora’s box, this unleashes destruction and war. A whole host of people are looking for the box, including Ishida Mitsunari, a subordinate of power-hungry Toyotomi Hideyoshi. Hideyoshi comes from peasant stock but succeeded Nobunaga and now rules most of Japan. Mitsunari is aided by his army of shinobi led by Kirigakure Saizo, Goemon’s childhood friend. As Goemon stumbles upon the secret of Nobunaga’s assasination, he is pursued not only by Saizo, but also their mentor Hattori Hanzo who is now working for Tokugawa Ieyasu. At the same time, Hideyoshi has been accumulating weapons including guns and cannons from the Europeans and is itching for war to establish his power once and for all. He is also courting Nobunaga’s niece, the beautiful and young Lady Chacha, to continue his bloodline and link it with that of the once mighty Nobunaga. As war looms, Goemon must decide what is important to him and choose between saving his country and the woman he loves. Kiriya’s films are achingly beautiful to look at, his action sequences slick and smooth and the costumes in Goemon are a mixture of the traditional Japanese and haute couture. 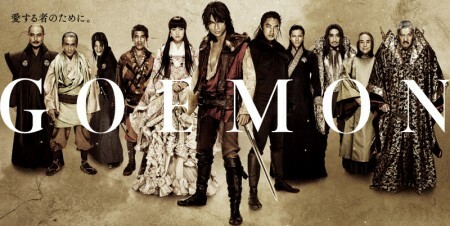 Although in places the film seemed a little like an RPG game with lots of CG, it is saved by the superb acting of the cast, especially Ōsawa Takao who plays Saizo and who has the most heart-wrenching role, closely followed by Eguchi Yosuke as Goemon, Okuda Eiji as Hideyoshi and the gorgeously evil Kaname Jun as Mitsunari. In addition to these big names in the Japanese entertainment industry, the film also starrs the Kabuki actor Nakamura Hashinosuke as Nobunaga and veteran actor Ibu Masato as Ieyasu. Although I felt the film could have been a little shorter, I’m just nit-picking because I enjoyed it tremendously and urge you to watch Goemon if you can, especially if, like me, you happen to like alternative historical fantasies. Although fleshed out with various legends, Kiriya’s film is based on actual events in Japanese history. Just in a way you’ve never seen before. Japanese horror movies are too scary for me too. I watched Ring several years ago and totally freaked out. But Goemon was really lovely to look at. It was a very interesting story because it had both historical and fantastical elements. And so beautiful to watch! This movie sounds very interesting. I like the idea that it has both historical and fantasy elements…very intriguing. I am going to have find this one so that I can view it. This movie sounds like a lot of fun, I’m going to have to see if I can find it. Thanks for joining in the mini-challenge again this month.